Cemetery Ridge would be contested ground during the second and third days of the Battle of Gettysburg. On the first day of the Battle of Gettysburg, July 1, 1863, Cemetery Ridge was unoccupied for much of the day until the Union army retreated from its positions north of town, when the divisions of Brig. Gen. John C. Robinson and Maj. Gen. Abner Doubleday from the I Corps were placed on the northern end of the ridge, protecting the left flank of the XI Corps on Cemetery Hill. After the XII Corps arrived, Maj. Gen. John W. Geary's Second Division was sent to the southern end of the ridge near Little Round Top; Brig. 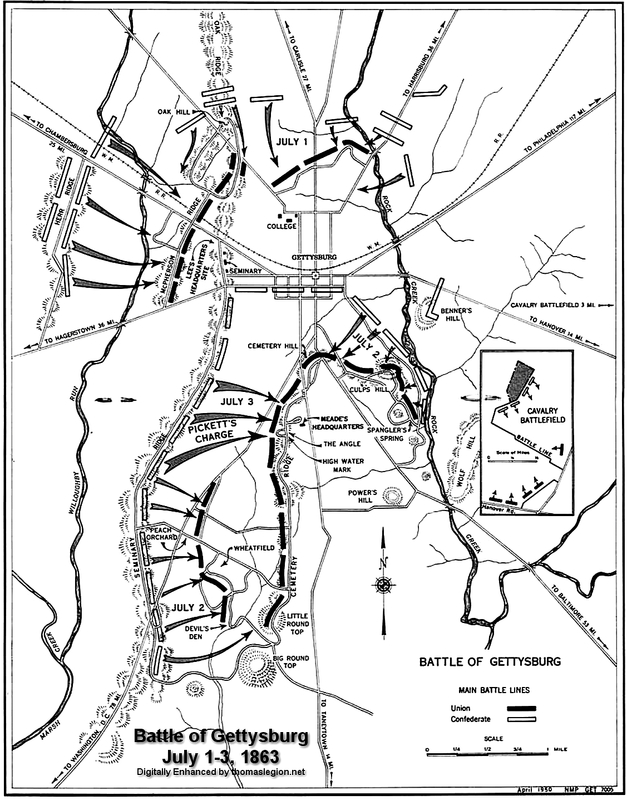 Gen. John Buford's cavalry division formed a skirmish line in the fields between Cemetery Ridge and Seminary Ridge. The III Corps arrived about 8 p.m. and replaced Geary's division (which was sent to Culp's Hill); the II Corps arrived about 10:30 p.m. and camped immediately behind the III Corps. During the morning of the 2nd day of fighting on July 2, Army of the Potomac commander Maj. Gen. George G. Meade shifted units to receive an expected Confederate attack on his positions. The II Corps was placed in the center of Cemetery Ridge, with Brig. Gen. Alexander Hays's division on the corps' right, John Gibbon's division in the center around the Angle, and John C. Caldwell's division on the left, adjacent to the III Corps; Robinson's division of the I Corps was placed in reserve behind the XI Corps. The V Corps was formed in reserve behind the II Corps. In the late afternoon, the end of the Confederate Maj. Gen. Lafayette McLaws's assault drove portions of Maj. Gen. Daniel Sickles's III Corps line back to the southern end of Cemetery Ridge, and Brig. Gen. Ambrose Wright's Confederate brigade temporarily captured the southern end of the Angle before being driven back to Seminary Ridge by the Philadelphia Brigade. Whereas Lee would withdrawal and move his battered and fatigued army toward Virginia on the 4th, Lincoln would demand answers as to why the Union commanding general did not press the offensive after Pickett's demise. Lee would remain in Virginia for the remainder of the conflict, unwilling and unable to take the fight to the North. 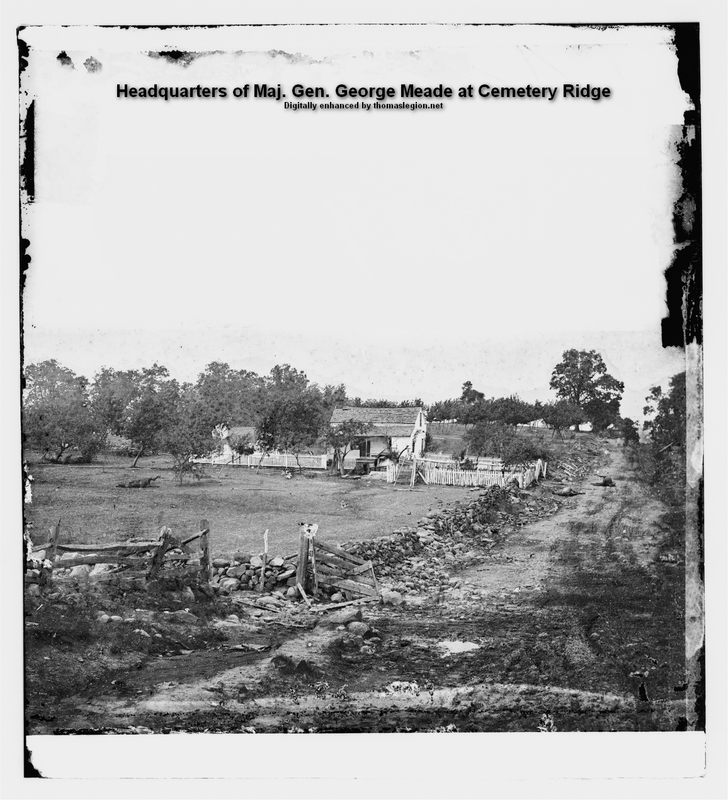 (Above) Maj. Gen. George Gordon Meade's Headquarters on Cemetery Ridge. While three dead horses are in the foreground, there are several more under the shade of the trees. Taken following Pickett's Charge on July 3, 1863. Alexander Gardner. Library of Congress. (Right) Hancock Avenue marks the line of Cemetery Ridge in the center of this view, taken in the 1980s. The Round Tops are in the distance and the Emmitsburg Road is to the right. Gettysburg NMP. The second day of fighting at the battle of Gettysburg on July 2, 1863, was the largest and costliest of the three days. The second day’s fighting (at Devil’s Den, Little Round Top, The Wheatfield, The Peach Orchard, Cemetery Ridge, Trostle’s Farm, Culp’s Hill and Cemetery Hill) involved at least 100,000 soldiers of which roughly 20,000 were killed, wounded, captured or missing. The second day in itself ranks as the 10th bloodiest battle of the Civil War. The third day of fighting consisted of Culp's Hill, Cemetery Ridge, namely Pickett's Charge, and two cavalry battles: one approximately three miles to the east, known as East Cavalry Field, and the other southwest of Big Round Top mountain on South Cavalry Field. Beginning on the southwest edge of Cemetery Hill, Cemetery Ridge runs southward approximately 1 1/2 miles to the Round Tops. Unlike Seminary Ridge, the gradual rise of Cemetery Ridge and better soil base allowed it to be farmed as pasture and planted in crops. Cleared of trees and lined with fences that could be used for emergency barricades and defenses, it was a perfect position for infantry and artillery to be placed to cover the ground to the west over which the main Confederate attack was directed. The Taneytown Road, which lies directly east of the ridge, was perfect for the rapid movement of troops, artillery and supplies up and down the line. 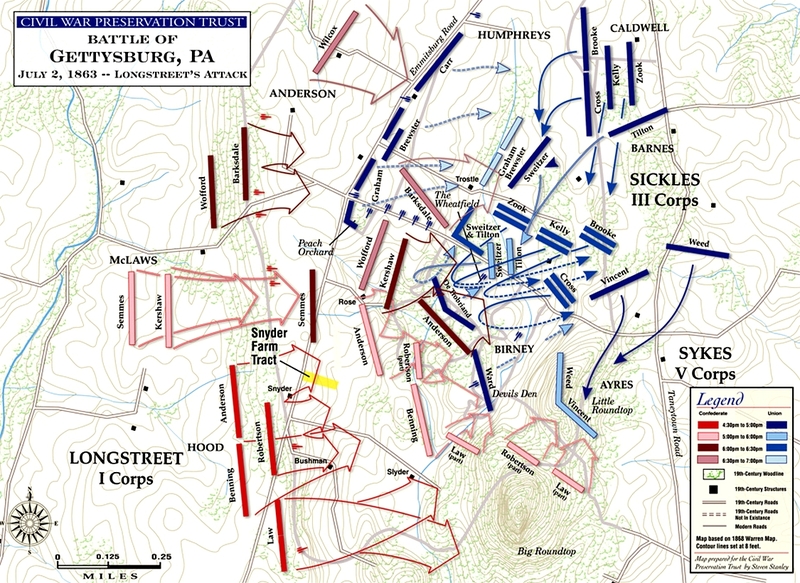 When General Sickles moved his Third Corps to the Emmitsburg Road on the afternoon of July 2, he left a large section of the ridge between Little Round Top and the Angle area unoccupied. This gap in the line was an open invitation for the Confederates to march through the center of the Union position and break it in half. But to achieve this goal, the Southerners would have to sweep away veteran Union regiments, determined to stop the Confederate attack before it reached that point. 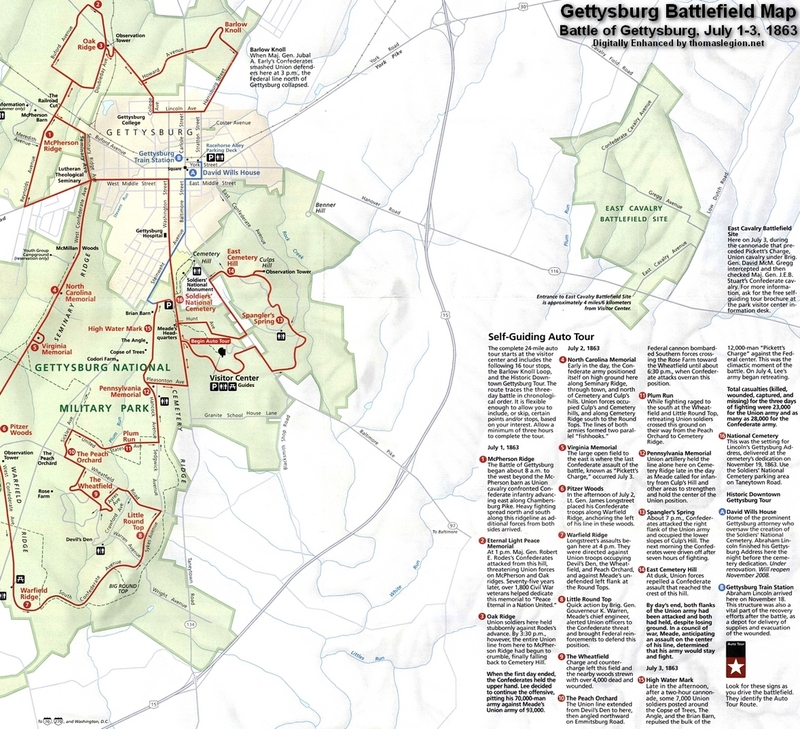 (Right) Battle of Gettysburg map showing troops movements on the last and final day of the fight in the otherwise small peaceful Pennsylvania town. Map courtesy Cartographer Hal Jespersen, posix.com/CW. For more outstanding Civil War maps, please visit Mr. Jesperson, cwmaps.com. Reserve troops rushed into battle by General Meade were sent to the left of the Third Corps line, which was facing the most pressure. Yet he was unable to fill the section of Cemetery Ridge vacated that morning by General Sickles. This left a gap between the area of the Angle to the north and Little Round Top to the south. Several hours into the fighting, three Confederate brigades under Generals Barksdale and Wilcox, and Colonel Lang threatened this area. Only a handful of battered artillery units fresh from the ordeal of the Peach Orchard and rallied by Colonel Freeman McGilvery were unlimbered along the ridge, and these were not enough to stop the masses of Confederate infantry moving across Plum Run valley below them. The long march under fire from Seminary Ridge to this point had disorganized the Southern formations and exasperated officers hurriedly reformed their commands at Plum Run, a crucial delay. 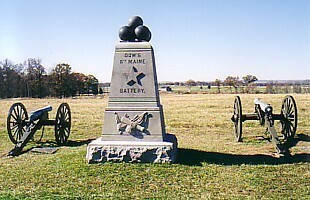 (Right) Union artillery had a commanding view over Plum Run as seen from Dow's Battery on Cemetery Ridge. Photo Gettysburg NMP. Seeing that troops were desperately needed in the center, General Winfield Scott Hancock quickly rushed forward a brigade of New York troops commanded by Colonel George Willard. The New Yorkers immediately charged into Barksdale's exhausted Confederates, driving them away from Plum Run and across the farm fields to the Emmitsburg Road. The 39th New York Infantry drove off Mississippians who had just captured Lt. Malbone F. Watson's Battery I, 5th US Artillery, and pursued the refuges into the Trostle yard where they, along with the 150th New York, re-took the lost guns of the 9th Massachusetts Battery. In the center of the fight, General Barksdale was shot from his horse and lay terribly wounded on the field until later that night when Union troops brought him in as a prisoner. 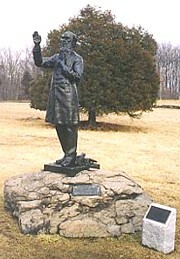 (Right) Photo of monument to the 1st Minnesota Infantry on Hancock Ave. Gettysburg NMP. Just north of Barksdale's hard-pressed Mississippians, Brig. General Cadmus Wilcox was getting his Alabama regiments started again when he was surprised to see a small formation of Union infantry appear in his front, take deliberate aim and fire. The line bore straight toward his brigade, light from the setting sun glittering on leveled Union bayonets. This lone Union regiment was the 1st Minnesota Infantry, stationed on Cemetery Ridge to support a Union battery. After directing Willard into battle, General Hancock observed that a critical gap still remained where Wilcox could break through. 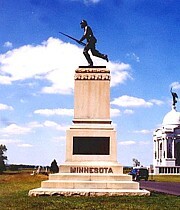 Quickly taking in the situation, he galloped up to the only available Union infantry at hand, the 1st Minnesota and its commander Colonel William Colvill, Jr. "My God," Hancock roared, "are these all the troops we have here?!" Colvill replied in the affirmative. "Do you see those colors? ", Hancock asked. The colonel peered through the battle smoke to see a large mass of gray-clad southerners with red battle flags defiantly waving above them. "Well, capture them! ", Hancock commanded, then galloped away to search for additional troops to fill the gap. Without hesitation, Colvill ordered his 262 officers and men forward toward Plum Run where they crashed headlong into Wilcox's men. Within minutes the charge was over. Barely a handful of Minnesotans escaped to rally on Cemetery Ridge, but they had stopped the Alabamians cold while Union troops from Willard's brigade and other commands moved in. Finding himself in danger of being cut off, Wilcox ordered his regiments to retreat and the threat was over. The 1st Minnesota Infantry suffered an appalling loss in this suicidal charge, and more soldiers in the regiment were killed and wounded the following day in repulsing "Pickett's Charge". The regiment's 82% loss at Gettysburg was never equaled by any other Union regiment during the Civil War. Just north of the melee in Plum Run, Brig. General Ambrose Wright's Georgia Brigade attacked Union troops at the Codori House and drove them back, pursuing the retreating soldiers to the Angle on Cemetery Ridge. Wright was vigorously counter-attacked by Vermont troops- "Green Mountain Boys" of the 13th, 14th and 16th Vermont Infantry Regiments, which overwhelmed Wright's Confederates, a number of whom were taken prisoner. This was the first and last battle for these Vermont "nine-month regiments", which would be mustered out two weeks after the close of the battle. With the arrival of fresh Union batteries, the gap on Cemetery Ridge was now closed. July 2nd ended under a fiery red sunset, in sympathy to the blood spilled in the fields, pastures, and woods of the Adams County countryside. On July 3, fighting resumed on Culp's Hill, and cavalry battles raged to the east and south, but the main event was a dramatic infantry assault by 12,000 Confederates, later known as Pickett's Charge, against the center of the Union line on Cemetery Ridge. The charge was repulsed by Union rifle and artillery fire, at great losses to the Confederate army. Lee next led his army on a torturous retreat back to Virginia. Some 51,000 soldiers (23,000 Union; 28,000 Confederates) were killed, wounded, captured or missing in the three-day battle. 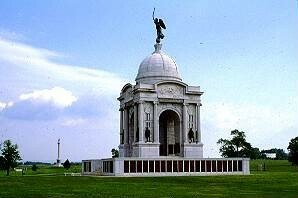 One of the largest and most ornate monuments on the battlefield, the Pennsylvania Memorial was constructed by the commonwealth in 1909-1910. This unique memorial is made of North Carolina granite set over an iron and concrete frame. Adorning the base are bronze statues of Pennsylvania-born generals, Governor Curtin, and President Abraham Lincoln. The statues were sculpted by several artists including J. Otto Schweizer, Cyrus E. Dalin, and Lee O. Lowrie. The prominent figure of Winged Victory by sculptor Samuel Murray, adorns the top of the dome. Around the base are bronze plaques that list the Pennsylvania regiments and batteries that participated in the Battle of Gettysburg, along with a list of the Pennsylvanians in each unit who were present during the three day battle. This project presented the state's monuments commission with special problems as the records and muster rolls were still in the possession of the War Department, and there were numerous spelling and statistical difficulties encountered. A large staff worked for over a year to complete the rosters, though corrections had to be made to the tablets after the dedication of the memorial on September 27, 1910. The work of architect W. Liance Cottrell of New York, the Pennsylvania Memorial weighs an estimated 3,840 tons and cost the state over $240,000. Another interesting monument near this location is that to Father William Corby, chaplain of the famous "Irish Brigade". On the afternoon of July 2, just prior to the brigade's advance to the Wheatfield, Father Corby stood upon a large boulder and granted general absolution to the catholic members of the brigade. It was a most stirring moment as the chaplain raised his voice above the din of battle while over 300 Union soldiers who were about to face death knelt before him. Within the hour, the brigade was in the thick of the battle. To commemorate this unique event, a statue of Father Corby was erected upon the exact boulder where he stood that afternoon, and was dedicated on October 29, 1910. After the war, Corby returned to his pre-war occupation of teaching at Notre Dame University and was appointed university president. He spent a few years away from Notre Dame for a brief appointment at Sacred Heart College in Watertown, Wisconsin, and returned to Notre Dame in 1877. The university flourished under his guidance until his retirement in 1881. Corby also founded the Notre Dame Post No. 569 of the Grand Army of the Republic, the only post in the nation, "composed entirely of members of a religious order." Father William Corby died in 1897 and is buried at Notre Dame where a similar statue to Father Corby stands today. During the Second Day of the Battle of Gettysburg (July 2, 1863) Confederate Gen. Robert E. Lee attempted to capitalize on his first day's success. He launched the Army of Northern Virginia in multiple attacks on the flanks of the Union Army of the Potomac, commanded by Maj. Gen. George G. Meade. After a short delay to assemble his forces and avoid detection in his approach march, Lt. Gen. James Longstreet attacked with his First Corps against the Union left flank. His division under Maj. Gen. John Bell Hood attacked Little Round Top and Devil's Den. To Hood's left, Maj. Gen. Lafayette McLaws attacked the Wheatfield and the Peach Orchard. Although neither prevailed, the Union III Corps was effectively destroyed as a combat organization as it attempted to defend a salient over too wide a front. 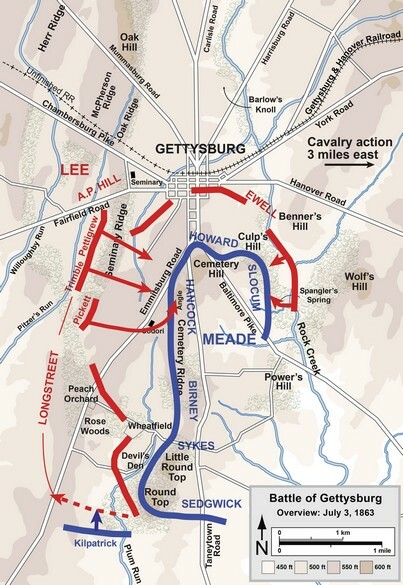 Gen. Meade rushed as many as 20,000 reinforcements from elsewhere in his line to resist these fierce assaults. The attacks in this sector concluded with an unsuccessful assault by the Third Corps division of Maj. Gen. Richard H. Anderson against the Union center on Cemetery Ridge. That evening, Confederate Second Corps commander Lt. Gen. Richard S. Ewell turned demonstrations against the Union right flank into full-scale assaults on Culp's Hill and East Cemetery Hill, but both were repulsed. The Union army had occupied strong defensive positions, and Meade handled his forces well, resulting in heavy losses for both sides but leaving the disposition of forces on both sides essentially unchanged. Lee's hope of crushing the Army of the Potomac on Northern territory was dashed, but undaunted, he began to plan for the third day of fighting. General Lee wished to renew the attack on Friday, July 3, using the same basic plan as the previous day: Longstreet would attack the Federal left, while Ewell attacked Culp's Hill. However, before Longstreet was ready, Union XII Corps troops started a dawn artillery bombardment against the Confederates on Culp's Hill in an effort to regain a portion of their lost works. The Confederates attacked, and the second fight for Culp's Hill ended around 11 a.m. Harry Pfanz judged that, after some seven hours of bitter combat, "the Union line was intact and held more strongly than before." Lee was forced to change his plans. Longstreet would command Pickett's Virginia division of his own First Corps, plus six brigades from Hill's Corps, in an attack on the Federal II Corps position at the right center of the Union line on Cemetery Ridge. Prior to the attack, all the artillery the Confederacy could bring to bear on the Federal positions would bombard and weaken the enemy's line. Around 1 p.m., from 150 to 170 Confederate guns began an artillery bombardment that was probably the largest of the war. In order to save valuable ammunition for the infantry attack that they knew would follow, the Army of the Potomac's artillery, under the command of Brig. Gen. Henry Jackson Hunt, at first did not return the enemy's fire. After waiting about 15 minutes, about 80 Federal cannons added to the din. The Army of Northern Virginia was critically low on artillery ammunition, and the cannonade did not significantly affect the Union position. Around 3 p.m., the cannon fire subsided, and 12,500 Southern soldiers stepped from the ridgeline and advanced the three-quarters of a mile to Cemetery Ridge in what is known to history as "Pickett's Charge". As the Confederates approached, there was fierce flanking artillery fire from Union positions on Cemetery Hill and north of Little Round Top, and musket and canister fire from Hancock's II Corps. In the Union center, the commander of artillery had held fire during the Confederate bombardment (in order to save it for the infantry assault, which Meade had correctly predicted the day before), leading Southern commanders to believe the Northern cannon batteries had been knocked out. However, they opened fire on the Confederate infantry during their approach with devastating results. Nearly one half of the attackers did not return to their own lines. Although the Federal line wavered and broke temporarily at a jog called the "Angle" in a low stone fence, just north of a patch of vegetation called the Copse of Trees, reinforcements rushed into the breach, and the Confederate attack was repulsed. The farthest advance of Brig. Gen. Lewis A. Armistead's brigade of Maj. Gen. George Pickett's division at the Angle is referred to as the "High-water mark of the Confederacy", arguably representing the closest the South ever came to its goal of achieving independence from the Union via military victory. Union and Confederate soldiers locked in hand-to-hand combat, attacking with their rifles, bayonets, rocks and even their bare hands. Armistead ordered his Confederates to turn two captured cannons against Union troops, but discovered that there was no ammunition left, the last double canister shots having been used against the charging Confederates. Armistead was shortly after wounded three times. There were two significant cavalry engagements on July 3. Stuart was sent to guard the Confederate left flank and was to be prepared to exploit any success the infantry might achieve on Cemetery Hill by flanking the Federal right and hitting their trains and lines of communications. Three miles east of Gettysburg, in what is now called "East Cavalry Field" (not shown on the accompanying map, but between the York and Hanover Roads), Stuart's forces collided with Federal cavalry: Brig. Gen. David McMurtrie Gregg's division and Brig. Gen. Custer's brigade. A lengthy mounted battle, including hand-to-hand sabre combat, ensued. Custer's charge, leading the 1st Michigan Cavalry, blunted the attack by Wade Hampton's brigade, blocking Stuart from achieving his objectives in the Federal rear. Meanwhile, after hearing news of the day's victory, Brig. Gen. Judson Kilpatrick launched a cavalry attack against the infantry positions of Longstreet's Corps southwest of Big Round Top. Brig. Gen. Elon J. Farnsworth protested against the futility of such a move, but obeyed orders. Farnsworth was killed in the attack, and his brigade suffered significant losses. Recommended Reading: Cemetery Hill: The Struggle For The High Ground, July 1-3, 1863. Description: Cemetery Hill was critical to the Battle of Gettysburg. Controversy has ensued to the present day about the Confederacy's failure to attempt to capture this high ground on July 1, 1863, following its victory over two Corps of the Union Army to the North and West of town. 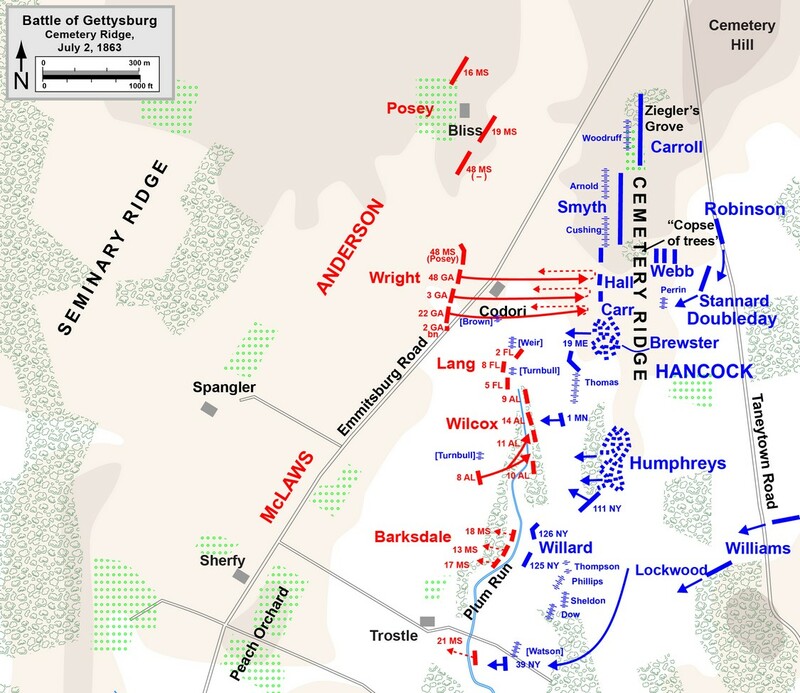 Subsequent events during the Battle, such as Pickett's charge, the fighting on Little Round Top, and the fight for the Wheatfield, have received more attention than General Early's attack on Cemetery Hill during the evening of July 2. Yet, the fighting for Cemetery Hill was critical and may have constituted the South's best possibility of winning the Battle of Gettysburg. Continued below. Terry Jones's "Cemetery Hill: The Struggle for the High Ground, July 1 -- 3, 1863" (2003) is part of a series called "Battleground America Guides" published by Da Capo Press. Each volume in the series attempts to highlight a small American battlefield or portion of a large battlefield and to explain its significance in a clear and brief narrative. Jones's study admirably meets the stated goals of the series. The book opens with a brief setting of the stage for the Battle of Gettysburg. This is followed by chapters describing the Union and Confederate armies and the leaders who would play crucial roles in the fight for Cemetery Hill. There is a short discussion of the fighting on the opening day of the battle, July 1, 1863, which focuses on the failure of the South to attempt to take Cemetery Hill and the adjacent Culp's Hill following its victory of that day. The chief subject of the book, however, is the fighting for Cemetery Hill late on July 2. Jones explains Cemetery Hill's role in Robert E. Lee's overall battle plan. He discusses the opening artillery duel on the Union right followed by the fierce attack by the Louisiana Tigers and North Carolina troops under the leadership of Hays and Avery on East Cemetery Hill. This attack reached the Union batteries defending Cemetery Hill and may have come within an ace of success given the depletion of the Union defense on the Hill to meet threats on the Union left. Elements of the Union 11th Corps and 2nd Corps reinforced the position and drove back the attack. Southern general Robert Rodes was to have supported this attack on the west but failed to reach his position in time to do so. General John Gordon's position was in reserve behind the troops of Hays and Avery but these troops were not ordered forward. The book deals briefly with the third day of the Battle -- the day of Pickett's charge -- in which the Southern troops did not renew their efforts against Cemetery Hill -- such an attempt would have had scant chance of success in daylight. The final chapter of the book consists of Jones's views on the events of the battle, particularly the failure of the Lieutenant General Richard Ewell of the Second Corps of Lee's Army to attack Cemetery Hill on July 1, a decision Jones finds was correct, and the causes of the failure of the July 2 attack (poor coordination among Ewell, Rodes, Gordon, and A.P Hill of the Southern Third Corps.) There is a brief but highly useful discussion to the prospective visitor to Gettysburg of touring the Cemetery Hill portion of the Battlefield. The book is clearly, crisply and succinctly written. It includes outstanding maps and many interesting photographs and paintings. The reader with some overall knowledge of Gettysburg will find this book more accessible that the two volumes of Harry Pfanz's outstandingly detailed trilogy that deal with the first day of the battle and with the fighting for Culp's Hill and Cemetery Hill. Serious students of the Battle of Gettysburg can get a good, clear overview of the fighting for Cemetery Hill from this volume. Recommended Reading: Into the Fight: Pickett's Charge at Gettysburg. Description: Challenging conventional views, stretching the minds of Civil War enthusiasts and scholars as only John Michael Priest can, Into the Fight is both a scholarly and a revisionist interpretation of the most famous charge in American history. Using a wide array of sources, ranging from the monuments on the Gettysburg battlefield to the accounts of the participants themselves, Priest rewrites the conventional thinking about this unusually emotional, yet serious, moment in our Civil War.